I’ve been focusing on getting fit for almost two months, so I thought I’d share with you what’s been working for me. Back in March, it clicked that I needed to get myself in gear. For months I was going out to lunch at work almost every day and then going home to sit on the couch and watch TV. I was miserable, my clothes didn’t fit, I was tired all the time, and I felt awful. Time to make some changes! I’m now almost 10 pounds down and feel amazing! Once I get focused, I’m a machine. I’m a cardio girl and have always loved aerobics classes. I recently joined a gym and their group fitness schedule changes daily, which is great for your body so you’re not doing the same workout over and over. I workout during my lunch or right after work, and it’s a nice break after sitting at a computer all day. Before I joined a gym, I would take a long walk during lunch. So if a gym isn’t for you, try getting outside and walking. What I like about this one is that Monday through Friday, your workout is planned for you. One day you may do 1 mile, the next 3, and up to 5! At the end of your mile(s), there are daily strengthening workouts. You may do abs, arms, legs, etc. The best part is that you can customize your workout, too. You can pull up the DVD menu, click on different walks (they’re all one mile and designated by color), plus a warm up, plus a cool down, and add your strength session. This DVD is similar in that there are 5 walking workouts, but they vary in level. All of the workouts are one mile so you can customize a workout, but there’s no fancy menu to do it for you like in the DVD above. One walk is a classic mile, then there’s one for arms, one for legs, one for tummy, and finally a speed walk. I like to group two together, plus the warmup and cool down. This DVD is a two-mile walk that targets your belly (which is my hardest area to trim down). The two miles are fast, so get ready to sweat! There’s also two floor workouts specific for the belly. This DVD is awesome because it gives you a six-day plan. You do the walk on Monday, Wednesday, and Friday and do the firm routine on Tuesday, Thursday, and Saturday. The walk on this one is a bit easier than some of the others, but you can add 1- or 2-pound weights while you walk. With the four DVDs, you can see how I never get bored. I have so many walks and routines to choose from that I actually look forward to doing these workouts. Who am I? LOL Check your library to see if you can borrow a copy and try them out before you buy! If you want to see results, you can’t do one thing (get moving) without the other (eat better). What works for me is counting calories. Don’t completely cut carbs, don’t just do a juice cleanse, and don’t deprive yourself. Having splurges every now and then is life. If you blow it out for one meal, get back on it for the next. You better believe I ate those Snickerdoodle Cupcakes and when my mom wanted BBQ for mother’s day lunch, I absolutely ordered a Redneck Taco AND pie! The key is not beating yourself up over it and getting back on track. By splurging every now and then, you won’t feel restricted. If you want some great low calorie recipes, check out my Low Calorie category. There are some amazing dishes that you won’t believe are low calorie. Counting calories really works for me, but the main goal is to eat better than you do now. I mentioned counting calories is a method that really works for me when trying to lose weight. It’s pretty simple that you burn more calories than you consume to shed weight. I’m pretty much the queen of counting calories and there are several tools out there to make it easy and fun. Two of them that I use together are my Fitbit One and LoseIt. I started out with a Fitbit Ultra and upgraded to the Fitbit One with bluetooth syncing. It’s a gizmo you wear that tracks your movements and tells you the calories you’re burning, how many steps you’ve taken, floors you’ve climbed, and your distance. It can also track your sleeping patterns. I wear mine all the time. There’s a free mobile app that it syncs with so I can get my stats throughout the day. I can’t say enough about this company and their trackers. When you can see what you’re doing, it makes you want to reach that goal of 10,000 steps a day! The Fitbit tracker will also sync to LoseIt. 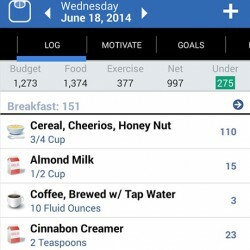 LoseIt is another app that you can use to track your food and activities. It can read my stats from my Fitbit so I don’t have to worry about entering exercises. I track my food throughout the day and it lets me know how many calories I’m consuming and how many I have left to make my goal. You can set your own daily calorie goal with how fast you want to lose weight. The interface is user-friendly and it has challenges you can join and create with other LoseIt users. I’m super competitive, so this was a huge motivator for me. I did have to pay for the premium version in order for my Fitbit to sync with it. There’s also MyFitnessPal that many of my friends recommend. It’s free and their food database is massive (better than LoseIt). The interface is crappy though, which turned me off. I hope this post helps you start your journey or gives you some new motivation to continue moving and eating better. I’d love to hear your tips on staying motivated and what you’re doing to help shed a pound or two, or just get in shape. Feel free to ask me any questions as well. Now let’s get moving! Disclaimer: I’m not a doctor, nutritionist, trainer, or health professional. Please consult your own health professional before starting a new diet and/or exercise program. What works for me, may not work for you. I’m simply sharing the tools that have brought me success. I’m not associated with any of the products/services mentioned above, nor did I receive compensation for this post. All opinions are solely my own, as always. This post contains affiliate links. Congratulations, Leah! 10 pounds already? That’s awesome! I’m going to my third Y class this evening – hot yoga – and I’m already looking forward to it. I renewed my Y membership nearly two months ago, and I don’t know what it was – must’ve hit rock bottom with the feeling sluggish, crammed into too-tight clothes – that finally clicked but I am so motivated to be active again! I’m hurting – a LOT – from the classes I’ve taken this week so that’s motivation, too. Getting into a routine so I’m feeling good sore, not can’t-climb-a-flight-of-stairs-without-moaning sore. I’m struggling to meet my step goals in addition to exercising. I still want to walk at least 10,000 steps more days than not in a week, so I need to make an effort to schedule breaks from my desk to either walk the lap track we have in the building or around downtown when the weather is nice. Thanks for sharing your journey with us! Love that I can find motivation in your story, too! Love that we both decided to make some changes! You’ll have to keep me posted about Hot Yoga. I’ve always been curious as to how it really is. You’ll definitely get to a point where you won’t be sore. I had lower back pain for what seemed like forever and it’s finally going away because my core is getting stronger. Yay! I’m so competitive that it really helped me to have coworkers on Fitbit. My goal was to be #1 in steps, lol. I’m so jealous you have a lap track in your building! We always take walking work breaks, but it’s getting too hot out now. Congrats on your success so far! My husband and I did a juice cleanse at the beginning of the month and it was definitely the kick start we needed on the path to get healthy. We’re eating way more fruits and veggies, we’ve cut out caffeine completely, and we only have “bad” carbs on our cheat day (today!!!!!! YAY!). I haven’t hopped on the scale yet, but I can tell that my body is feeling better and my clothes definitely fit better. Wow, Jacki! More power to you for doing a juice cleanse. I tried once and failed miserably, ha! That’s great you’re eating more fruits and veggies, too. I find that my body will start to crave those things more than the junk. Funny how that works! My “cheat” day is today, too. I always go to lunch with my coworkers on Friday. Today is hot chicken and I cannot wait! I love my fitbit too! I get so excited when I hit 10,000 steps. I have the scale that goes with it too. Thanks, Natalie! Ooo, I thought about getting the Aria. I’m such a sucker for techie gadgets. I love my Fitbit! And that belly blaster walk is something I need to learn more about. Thanks, Lesley! I love that DVD because the two miles are fast and then you get the floor exercises. I don’t want to spend hours and hours working out (even though I’m enjoying it). Congrats on dropping the 10! That’s the amount I want to shed. I hate any food deprivation….seems whatever I’m not “suppose” to have is exactly what I want! I know its all mental but hey, its what happens. Calorie reduction and adding exercise back into my day is the my plan! 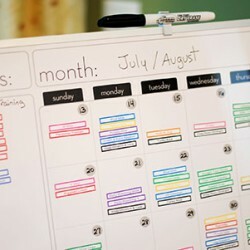 I’d be interested in seeing a few sample food logs of what your eating during your week. good for you! i had no idea that walking could be so diverse and structured — glad you found your fitness jam! i love running but also enjoy a good walk, especially over lunch or after dinner. Ha ha, I did find my jam! Some of those walking workouts really wear me out!